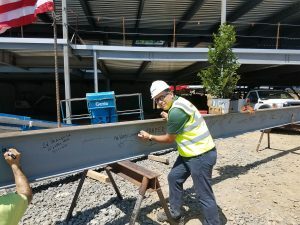 On Wednesday, July 11th, VERTEX Sr. Project Manager, Vince Harriman, and VERTEX Project Manager, Kevin DiMarco, attended a topping out ceremony in Chadds Ford, PA. General Contractor, Cutler Associates, Inc. of Malvern PA and their steel subcontractor, O’Rourke & Sons of West Chester PA, hoisted the final beam into place just before noon on behalf of the developer, LCB Senior Living and equity partner, AEW. 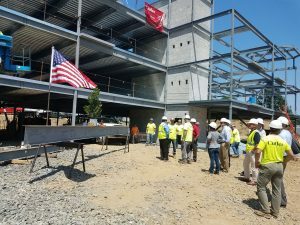 The Residences at Chadds Ford will be a residential retirement community with 84 units over 92,000 square feet with first class amenities including a fitness room, interior recreational space, a private dining room, a fitness center. The Residences are scheduled for a Spring 2019 opening. 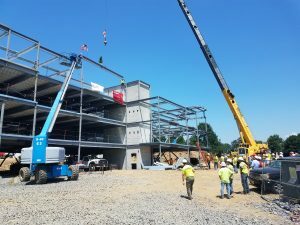 VERTEX provides Owner’s Project Management services on behalf of AEW with bi-monthly meetings and oversite of project progress, QAQC and cost control. To learn more about VERTEX’s Construction Contracting & Consulting services, call 888.298.5162 or submit an inquiry.